Directions: Adults mix 1 scoop with 8-10 oz of water (adjust for taste preference). 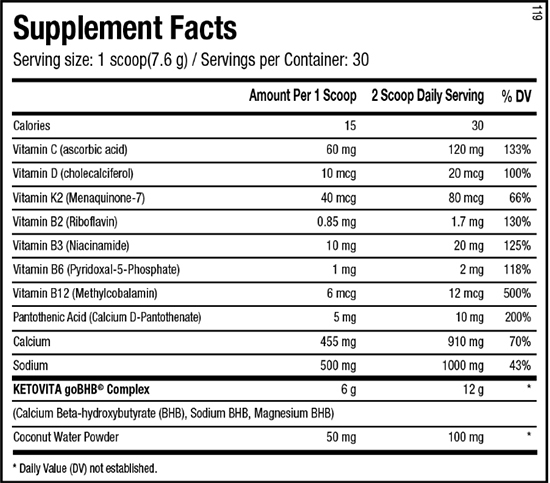 Use as needed throughout the day, up to a maximum of 2 scoops daily. 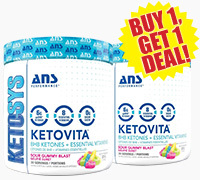 **For best results use with a low carb or ketogenic diet and an exercise program. WARNING: This product is only intended for healthy adults 18 years of age or older. Do not use if pregnant or nursing. If you are using any prescription or over-the-counter medicines, are unaware of your current medical condition, have any pre-existing medical condition(s), have hypersensitivity to sodium or have any risk of kidney stones, consult with your physician before using this product. Immediately discontinue use and contact your healthcare professional if you experience any adverse reaction to this product. Use occasionally, only as directed. Do not use if safety seal is broken or missing. KEEP OUT OF REACH OF CHILDREN. Store in a cool dry place. ALLERGEN WARNING: Contains ingredients from coconut. Made in a facility that also processes milk, soy, sesame, egg, peanuts, tree nuts, fish/crustaceans/shellfish oils, and wheat products.